The UTI Mutual Fund's Swatantra on ET Now moved to Mumbai, the financial capital of the country, where in the last week of November a large number of young, college students interacted with three experienced financial advisors. The panel of experts, Tarun Birani, founder & director, TBNG Capital Advisors, Nitesh Dhandharia, principal financial advisor, 3i Wealth Advisors and Paresh Bhide, independent financial advisor, along with the moderator Faye D'Souza from ET Now, interacted with the students to guide them about investing, clear their doubts and answer their questions.The discussion started with D'Souza asking the panelists about their views about when should a young professional start saving and investing, and how much should they save.According to Dhandharia, it all depends on how much a young professional is able to save. He felt that given India's savings to GDP ratio at 32%, one should have a slightly higher savings ratio of 35%. Dhandharia said if one is able to save 35% and is able to buy any other gadget or instrument like an expensive cellphone or a tablet with the balance 65%, then that should be fine. According to Birani, the young students have a far better chance to take care of the power of compounding since they have about 35 years ahead of them before they retire. “This is the right time to start saving, as much as possible, and it should all go into equities,“ he said. The next question from D'Souza was that the moment a student takes up a job and joins the workforce, banks start approaching them with preapproved personal loans. So her question was how students should decide how much they should set aside for savings, and how much they should borrow. According to D'Souza, while taking a loan and paying interest while paying the loan, it's important to keep in mind that loan should be used to buy an asset whose value should appreciate over time. For example, the if one buys a house with loan, its value is expected to appreciate, while if one buys a car, its value is expected to depreciate over time. “You should always consider what you are using the money for, whether it's going to appreciate or depreciate, going forward,“ she said. On a question about attractiveness of green bonds in India__the Debt papers issued to support the government's clean and alternate energy initiatives__the unanimous view was that bonds usually do not beat the rate of inflation, but they just about match the same. So one could invest in those who is willing to settle for a steady stream of returns that just about matches the rate of inflation. On the issue of whether to invest in stocks or fixed deposits, Birani cited a study that showed that if one invested Rs 25,000 every month in the sensex stocks for 20 years, at the end of the term, going by 15% average annual return compared to sensex's historical compounded annual growth rate (CAGR) of 17%, he would have a corpus of Rs 3.75 crore.Now if the same amount is invested in FDs, which gives an average annual return of 8%, the total corpus would be about Rs 1.5 crore. “The difference is approximately Rs 2 crore. This extra savings is the power of compounding from the extra 7% that one could get n equities,“ he said. “One should put money in fixed deposits if you need money in case of an emergency, for meeting expenses during contingencies. For long term asset creation, there are just two asset classes, real estate and Equity. To invest in real estate you need huge amount of money, while to invest in equities, you can start with as little as Rs 500,“ Birani said. According to Dhandharia, returns from FDs are also taxed while as an investor one should consider post-tax return and not pre-tax return. “Today you are getting 9% in FDs, with no tax burden, so the pre-tax and post-tax returns are the same.Three years down the line you'll be in the 30% tax bracket, the 9% that you are getting today will be 5.4% post tax. Whereas equities, which can give returns of 15-17%, stays there. So there power of seven, in the long run will become the power of 10,“ he said. D'Souza also explained the impact of inflation and said that FD returns are linked to the rate of inflation in the economy.“What the fixed deposit will do is generate a return that is prob ably ok today or even two years down the line,“ she said. But over the years, if one remains invested in FDs, inflation will actually bring down the worth of the money that is invested over the years, she said. On an investor query on what kind of mutual funds he should invest, Dhandharia said that it should depend on your risk appetite. “When I talk about large and multi-cap mutual fund schemes, they will invest in the top 100 companies listed on the bourses. Mid-cap schemes will invest in the second rung companies. 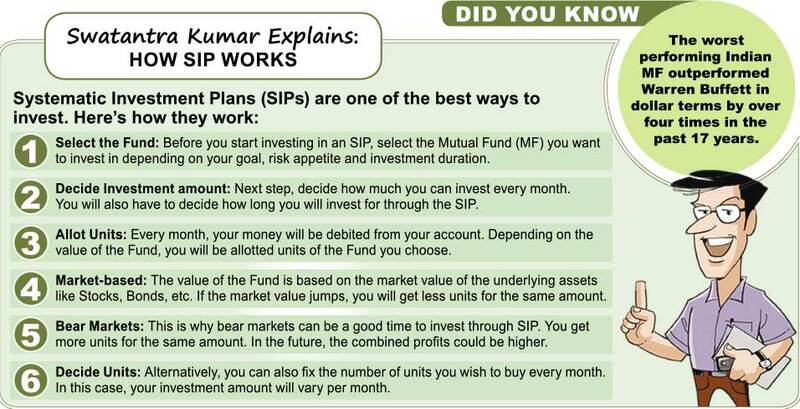 Since you are a high risk investor, I would prefer you to go for midcap schemes, because today's midcaps will be tomorrow's large caps,“ he said.“There's a saying that large caps will always protect your money while midcaps will create wealth for you. At your age, probably a higher allocation to midcaps makes better sense than large caps,“ he said.